“The business value of technology is limitless in this rapidly growing field. Humans already depend on robots in many spheres – surgery, unmanned drones,” explains Yoel Rothschild, Head of Mushinsky Sci-Tech Center for Research and Development. 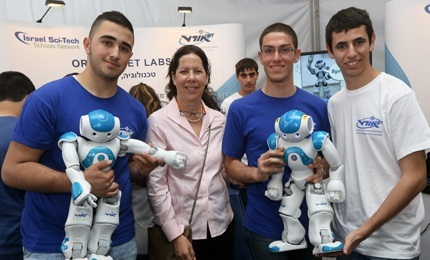 Israel Sci-Tech offers youth an immensely fun way to prepare for a career in a new, complex world while making a real contribution. Students design and build robots for varied applications. The study of Robotics and Artificial Intelligence is part of our science and engineering track. It includes topics from the field of robotics, artificial intelligence, neural networks and computerized vision. Students build projects based on the principles of robotics and technology for the benefit of humankind, for example: a “robot guide” which could replace the guide dog and serve as the eyes for blind people. Nanotechnology is constantly developing and already there are quite a few applications that have made it onto the market, it makes sense to provide information on nanotechnology in the schools as well. 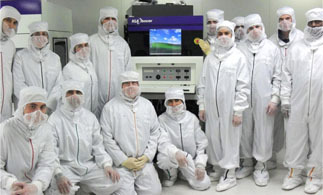 Nanotechnology involves utilizing the unique characteristics of miniaturized components (from just a few nanometers to a tenth of a micron) in order to produce materials with new properties. This program introduces students to this ‘work-in-progress’ field, familiarizing them with scientific knowledge as well as social and environmental implications. The project is accompanied by a web-based course and practical laboratory experiments. Ebin Sci-Tech and Ramat Yosef Sci-Tech schools are the two pioneer schools where the program was implemented during 2011-2012, acting as a pilot program for integrating this field into the classroom. A unique program in electro-optics is being developed in partnership with the Israel Sci-Tech R & D Center as part of the Israel Sci-Tech Center for Excellence in Technological Leadership located in Migdal Ha’Emek. The aim of the program to provide high-school students with extensive in-depth scientific knowledge in the fields of physics and comprehension of engineering in order to develop technological applications in electro-optics, so that they can, in the future, integrate into academic studies in the field and/or to engage in it. Our electro-optics students may look as if they are stepping into a rocket ship, but they suit up for their specialized laboratory donated by Israeli corporate KLA. This program educates students to protect the environment focusing on the three main elements that are related to environmental quality: air, water and energy. Development of curricula (as part of the studies in the science and engineering track) that includes topics at the forefront of scientific technological research in the field of flight and aerospace, including: the basics of aeronautical engineering, UAVs, propulsion of aircraft and missiles, man in space and space stations, ground stations, cosmology, astrophysics and more. The study is interesting and experiential, including educational field trips to the aerospace industry, etc., attending study camps, and integrating experimental and challenging activities such as: constructing and launching a hot-air balloon. Nowadays, cyberspace includes many systems – starting with our smart phones and our personal computers, through health and banking services, and national systems such as power grids and communication. Attacking these systems could impact the daily lives of each and every one of us. Hence, it is extremely important that we learn to protect cyberspace, and this subject is being developed in the Israel Sci-Tech as part of the software engineering track. This is being led by the relevant discipline director at Israel Sci-Tech’s Goralnik Institute, in partnership with the Ministry of Education and the IDF’s 8200 Unit. We’Google and Israel Sci-Tech Schools Network have signed on an agreement where we will manage Google’s implementation activities and training in the Israeli education system. Israel Sci-Tech has planned and executed the first and second programs of the Google Academy for Teachers, in addition to which it is responsible for the implementation vis-à-vis all the educational bodies in Israel. For more information about the program, visit http://www.gteachers.co.il/. The brain sciences curriculum will be taught within the Science & Engineering track. The main considerations guiding the development of the curriculum are: students, accumulation of scientific knowledge in this field, with an orientation towards the engineering aspect; arousing their curiosity and pleasure in the learning process by demonstrating the relevance of science and engineering and encouraging students to continue in this field. The main pedagogical approach underlying the development of the curriculum is such that it encourages independent thinking, creativity and criticism, the development of problem-solving skills and project-based learning (PBL), which stresses self-study, team work and peer assessment. Parts of the study will be carried out in small teams, around focused projects or topics. Among the sequence of topics to be studied, the curriculum will also include reference to a number of axes: biological aspects, calculations, behavioral aspects, research and diagnosis methods, technological-engineering methods, and ethics. Starting in September 2014, this curriculum is being taught in two Israel Sci-Tech schools as a pilot. A specialization in the mechanics track – an innovative technology field which integrates electronics, computers and the principles of contemporary science and technology to create an integrated synergetic-mechatronic system. Students are exposed to levels of thinking and a vision of the technological process, and problem – solving through teamwork. Classes take place in a computerized environment using the most advanced software and systems. The Israel Sci-Tech R&D Center has developed a textbook and a website dedicated to students who specialize in this track in high school. The specialization was implemented this year in 12 Israel Sci-Tech schools.